Clarifye is advanced digital technology with the personal touch of your skilled optometrist. With Clarifye we are able to map the unique “fingerprint” of your eyes with digital precision, pinpointing the exact prescription you need for optimal vision. The iVue OCT System is a powerful clinical tool that transforms the way you assess the retina, optic disc and the cornea. Quantify the thickness of the retina, nerve fiber layer, ganglion cell complex and the cornea. Track change and predict trends in RNFL and GCC thickness and precisely measure angles to aid in disease diagnosis. Streamline your specialty lens fits with a new view of the cornea and precision measurement tools. Ocular fundus imaging plays a key role in monitoring the health status of the human eye. 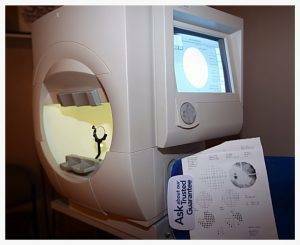 Currently, a large number of imaging modalities allow the assessment and/or quantification of ocular changes from a healthy status. Features the latest in Canon retinal imaging technology and enhancements in a compact and lightweight design. Fundus imaging is essential in the diagnosis and monitoring of various ophthalmic diseases. A major advantage is that the doctor can share these images with specialists at other locations and/or times, they can also magnify areas of interest that cannot be easily seen with a handheld ophthalmoscope. 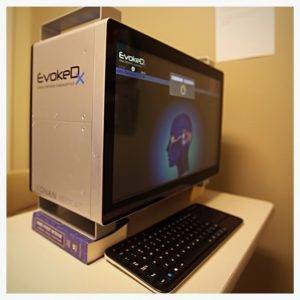 Visual Evoked Potentials – Clinical Benefits Visual Evoked Potentials (VEPs) provide objective, quantitative information about the functional integrity of discreet visual pathways in a noninvasive manner. This is new information that is complementary to the structural analysis obtained from technologies such as OCT and Fundus photography and augments subjective information from standard visual acuity and perimetry. Electroretinograms (ERGs) reflect the integrity of the optics, photoreceptors, bipolar cells, and retinal ganglion cells. Clinically, ERGs may be useful when patients have abnormal VEPs to differentiate between retinal dysfunction and dysfunction occurring in the optic nerve, optic radiations, and occipital cortex. Our office offers ultra-wide field images. 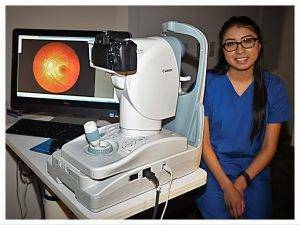 Ocular fundus imaging plays a key role in monitoring the health status of the human eye. Currently, a large number of imaging modalities allow the assessment and/or quantification of ocular changes from a healthy status. 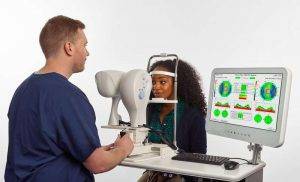 Features the latest in Canon retinal imaging technology and enhancements in a compact and light weight design. Fundus imaging is essential in the diagnosis and monitoring of various ophthalmic diseases. A major advantage is that the doctor can share these images with specialists at other locations and/or times, they can also magnify areas of interest that cannot be easily seen with a handheld ophthalmoscope. We have recently acquired the most technologically advanced field analyzer for glaucoma diagnosis and management. Validated by more than 25 years of research, design and clinical experience, the Humphrey® Field Analyzer (HFA™) is the accepted standard of care in glaucoma diagnosis and management, as well as detecting stroke and brain tumors. Clinical Benefits Visual Evoked Potentials (VEPs) provide objective, quantitative information about the functional integrity of discreet visual pathways in a noninvasive manner. This is new information that is complementary to the structural analysis obtained from technologies such as OCT and Fundus photography, and augments subjective information from standard visual acuity and perimetry. Electroretinograms (ERGs) reflect the integrity of the optics, photoreceptors, bipolar cells and retinal ganglion cells. Clinically, ERGs may be useful when patients have abnormal VEPs to differentiate between retinal dysfunction and dysfunction occurring in the optic nerve, optic radiations and occipital cortex. Actual medical images of retinas taken by our occular fundus digital camera.